You are going to make a lot of new friends and see players you want to follow on Bridge Base Online (BBO), both in the social rooms and in the various private organization tournaments where you play. 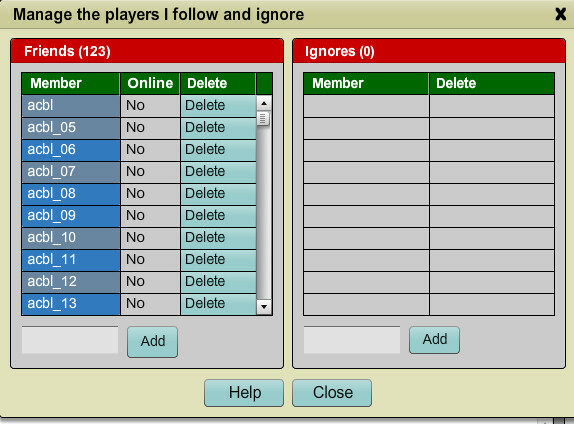 With the hundreds of thousands of bridge players that are on and off BBO each day, you'll need a place to keep track of your friends and players you want to follow so they don't get lost in the crowd. 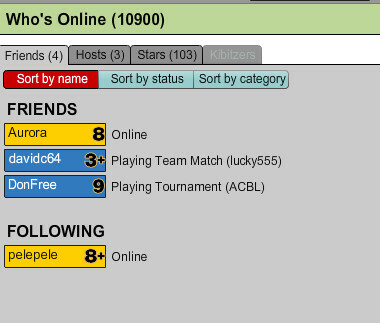 We've made it easy for you to manage your lists of friends (and perhaps list of players you need to ignore), so you can know where they are on BBO, when they log on and what they're doing while they are here. If they are playing, there is a way for you to join their table with one click. You can find your list of friends (and list of usernames you are ignoring) by starting with the My BBO button. This is found on the top horizontal row of buttons. Next, click on Manage the players I follow and ignore in the popup menu. You will now be shown a screen separated into two sections - the left for your list of Friends in alphabetical order, the right for the Ignores. There are two ways to add to these two lists. To add a name, type the username directly into the appropriate space on your Manage the players I follow and ignore window, and then click Add. This has the advantage of being able to add friends even if they're not online at the time. You can also right click on a person's username who is logged in define their username as you choose, follow, neutral or ignore, and that person's name will be added to the selected list. You can also search for a username and make the same selection whether or not they are logged in by using the search feature on the bottom list of options. Type the username in the space provided next to "Find member." And on the bottom right hand side of your screen is a Friends button, a short cut to your list of players you follow and ignore. This easily maintained friends list has options other than adding and deleting names. A system generated message tells you when a friend has logged on, the Who's Online screen shows if a friend is online, and clicking on one of the names on either the Friends or Ignores list pulls up that player's profile and shows if they are online or offline. On their shown profile you can click to send the player a message if they are not in a tournament, leave BBO email for them if they are in a tournament, ask to join their table or initiate the Private Chat option. 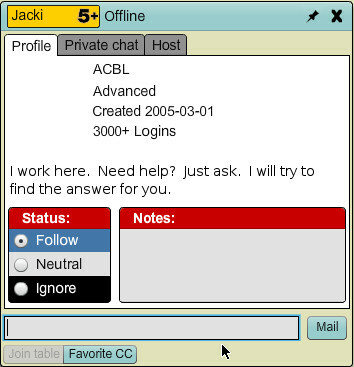 The Private Chat tap puts your conversation with that person in a separate window so you don't miss any replies that may get lost in the middle of other messages scrolling by in your chat window. Review our help file on Mail and Messaging for more details. Speaking of chat, defining someone as an Ignore mutes any chat that player sends to you. You simply won't get it. Once you remove the person from your Ignores list you will again be able to receive messages from that person, including BBO mail messages. A handy feature of the profile is your ability to add your personal notes to a player's profile. These notes can be anything from your opinion of their bridge ability (or lack thereof), to personal observations (they live in the same city as you), to the systems they do or do not play (e.g., doesn't like SAYC, only plays 2/1). 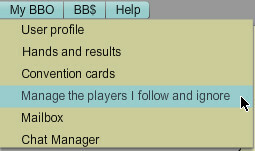 It's not necessary to mark a person as a friend in order to add player notes, you can use this feature with any one you have contact with on BBO. People you have marked as "friend" but do not have your username marked as a friend are shown on the Following list of players logged into the site.